This month marks the 20th anniversary of Final Fantasy VI‘s Japanese release, and despite the game’s age (and the technical limitations of its platform, the SNES), I still think its soundtrack is one of the best in video game history. I’ve also been meaning to get back into practice with the piano! 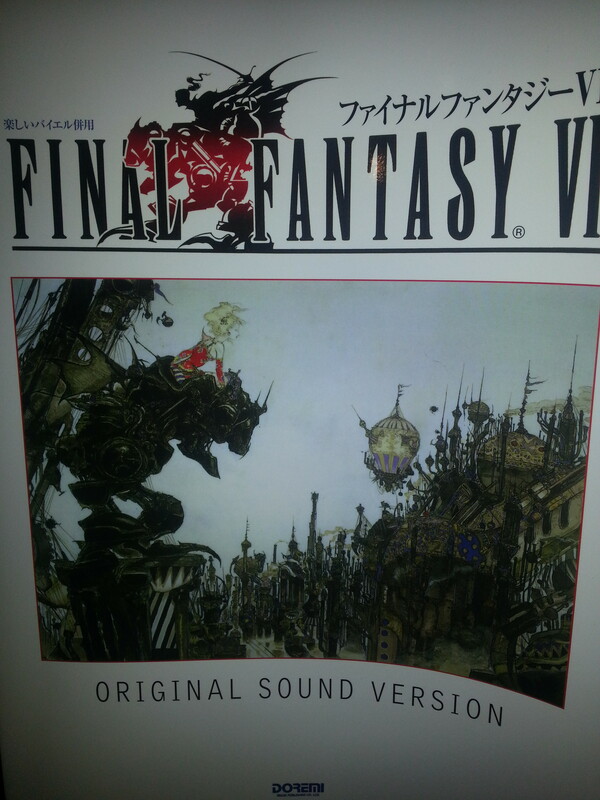 So it was a thrill to find, and be able to import, Final Fantasy VI: Original Sound Version Piano Solo Sheet Music via Amazon. You can see my recently arrived copy on the left, and if you’d like to peek inside, I’ve posted the book’s version of Terra’s theme at the bottom of this page. The book itself is a 197-page collection of what I believe is every single song on FF6‘s OST, from opening to ending (1). According to the Final Fantasy Wiki, it’s aimed at beginner to intermediate pianists, and this sounds about right — after so many years of disuse my skills have atrophied all the way back to “beginner”, but with a bit of work I can still play recognisable, if mangled, character themes. 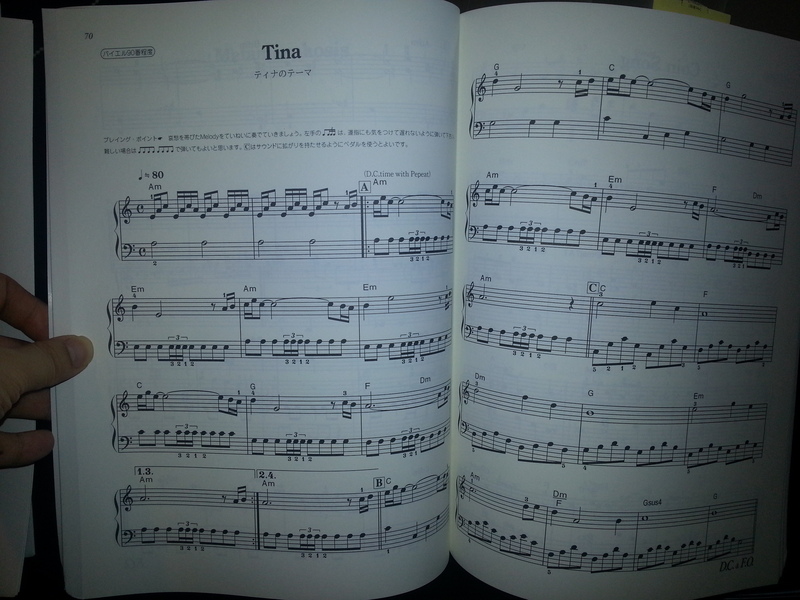 On this note, the book’s arrangements (by Asako Niwa) hew quite closely to the in-game music, perhaps a little too closely — many songs loop rather than tapering to a “natural” close. Still, I think the book’s literal approach works — it preserves the strength, clarity, and simplicity of Nobuo Uematsu’s original soundtrack, and since I know the game music quite well, this also makes it a bit easier for me to learn. Overall, I am very happy with my purchase so far. While it’s still early days — I haven’t even touched the left-hand part of each song — I feel that the book sits in the happy intersection between “easy on the ears” and “not too hard to learn”. It’s also succeeded at motivating me to pick up the piano again — I think I’ve played more in the last couple of weeks than I have in the last few years. Book in hand, I plan to keep practicing hard, and (with the proviso that it is a bit expensive) I’d recommend it to anyone else who might be interested. Do you play music? If so, what do you like to play, and have you tried your hand at soundtracks? Drop a note in the comments! (1) Note that there is another, separate book called Final Fantasy VI Piano Collections, which contains fewer songs, is a bit more ornate in its arrangement, and is aimed at more advanced pianists.